First Line: "More flowers?" Ginger Lancaster asked as she walked into My Sister's Closet, her best friend's secondhand store, on the heels of Henry Dawson, the local florist. It's a few days before Valentine's Day, and Maggie Gerber is receiving messages and roses from a secret admirer. Well, she's pretty sure they're from Sam Collins, the chief of police of their small town in Virginia. He's certainly putting the roses in her cheeks while she and her Good Buy Girls plot their strategy for the upcoming Presidents' Day sales. However, things start looking like a dead car battery when you're running late for a 75% off shoe sale when the mother of Maggie's nemesis, Summer Phillips, shows up in My Sister's Closet. Summer's mother is determined to break up Maggie and Sam. You see, Maggie's not nearly good enough for Sam while Sam is just perfect for her darling daughter. When Maggie goes to Summer's house to confront the scheming woman, she finds Summer holding a weapon and standing over a dead body. No matter how much Maggie despises Summer, she just can't get over the feeling that the woman is innocent-- and she's willing to conduct her own investigation to prove it. No two ways about it-- I love this series. It's a bit of a surprise since I believe the best bargain is getting out of shopping altogether. Just goes to show that these books are about so much more than bargain-hunting women on a mission to shop. Out of all the crime fiction that I read, Maggie Gerber is one of my favorite characters. Her depth of spirit and heart make her a wonderful mother and friend; she's got a good sense of humor; and she's feisty and not afraid of standing up for what she believes in. Maggie sounds like a paragon, doesn't she? Well, she almost is... that feisty temper of hers leads to some rash decisions sometimes. 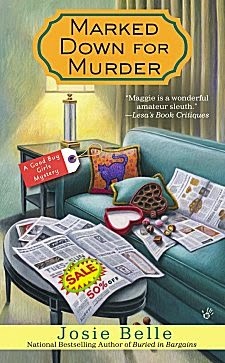 Maggie's group of friends-- her Good Buy Girls-- is one of the best supporting casts you'll find in any traditional mystery series. Each friend has her own personality, her own quirks, but together they become one formidable team. As the series progresses, each character's life becomes as real as your own. In Marked Down for Murder, I particularly enjoyed watching how Maggie agonized over a potential obstacle in her growing relationship with Sam-- undoubtedly because I faced something very similar myself. Another thing that puts this series-- and this book in particular-- a cut above the rest is how author Josie Belle (AKA New York Times bestselling author Jenn McKinlay) deals with Maggie's nemesis, Summer Phillips. Summer has always been a bit over the top for me, and I tended to scringe whenever her scenes came up. Not in Marked Down for Murder. By bringing in Summer's mother as a character, we're able to see why Summer behaves the way she does, and although we still may not like her, at least we have a better understanding of her. The author knows that, if you're going to have a highly irrational character, it's better to explain a little of her behavior; otherwise, she's just a caricature. After singing so much praise of the characters, you're probably wondering if there's a mystery at all in the book. There is, and it's a good one that I enjoyed trying to piece together as the pages turned. There's no doubt about it: if you're in the mood for an enjoyable mystery filled with wonderful characters, all you have to do is get your hands on the Good Buy Girls. Sounds like a great series with that rec. Cathy - You put your finger on something that I always notice in books: How does the author treat the not-so-pleasant characters? Are they 'human' too, so that we know why they are the way they are? If so, the book is that much more credible for me.